Rocket Matter Knowledge Base Invoices: Bulk Payments and Adjustments -NEW!How to apply payments to invoices in bulk. 2. In order to pay your invoice(s) you must first enter a client, matter or invoice number. To further filter your results, enter a specific time frame or custom field. Note: You can take a deeper look and filter between unpaid, paid or all invoices for your client. 5. 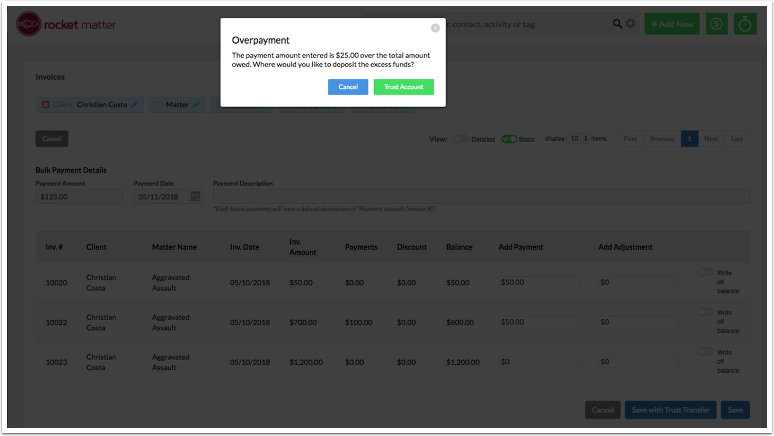 Once your payments have been allocated to your invoices correctly, select 'Save' on the bottom of the screen to record the payment. 'Save Credit Card/E-check Payment':Take advantage of our fully integrated merchant processor, LexCharge! Accept credit card payments and e-checks with one click, and your funds will be moved right into your operating account. Want to learn more about payment processing with LexCharge, click here! 'Save with Trust Transfer': Transfer funds from the clients trust account to pay their invoice(s). 'Save': Clicking 'Save' will record the payment(s) on the matter ledger(s). Prev: What is the 'Invoices' section? Next: How to transfer trust funds in bulk for invoices.